Surviving the first four waves was nearly impossible. Now Cassie Sullivan finds herself in a new world, a world in which the fundamental trust that binds us together is gone. As the 5th Wave rolls across the landscape, Cassie, Ben, and Ringer are forced to confront the Others' ultimate goal: The extermination of the human race. The first three waves have almost wiped out humanity, the fourth wave turned survivors against one another and now the fifth wave could strike at any time. It took the earth ten thousands years to build our civilisation and only ten months to destroy our world. They struck without warning, without cause and now Cassie Sullivan finds herself waiting for Evan, a species of conscious that occupies a human body. He promised he would find her and she refuses to accept that he may not be returning. The Earth dark and quiet, the way it was before we showed up to fill it with noise and light. Something ends. Something new begins. This was the in between time. The pause. But their location is no longer safe with air patrols and Vosch's team hunting them down, it's Ringer who scouts ahead to find an alternative, but Teacup sneaks out to follow her and the two now are late to return. But as the war turns into a deadly game with human sacrifices, it's clear that Vosch is no longer playing by the rules. The war is on their doorstep and the small group of resilient survivors won't all make it out alive. They are being tested, tormented and it's time to fight back. The 5th Wave series is the ultimate in post apocalyptic young adult. Our world is under attack from a superior race that are wiping out humanity. The genocide comes in waves. The first wave plunged our planet into darkness. The second brought earthquakes and tsunamis to cleanse the Earth. The third wave spread a virus amongst the population and in the fourth wave comes the Silencers, being that have taken on the form of human soldiers to destroy the weak. The fifth may just be the most horrific, human sacrifices. 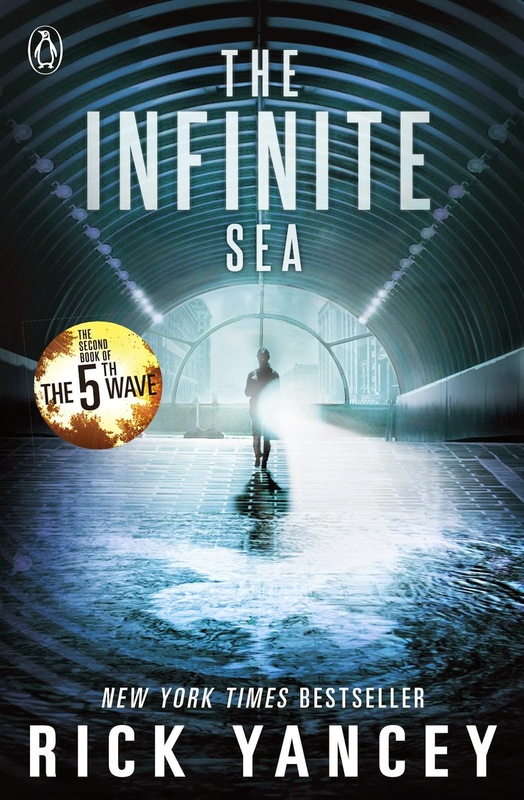 The Infinite Sea is explosive, it picks up shortly after the heart stopping end of book one where the small group of survivors now await their fate. After the fourth wave, humanity realised that they are fighting an enemy that look and sound human. The invaders true self being a conscious that inhabits a human body, and leaves us unsure of who to trust. Following the perspective of several characters, we learn more about the surviving teens and how they came to be part of the group. One in particular was incredibly emotional and paved the way for an emotional parting with one character. The premise is incredible, the execution is phenomenal. Rick Yancey is an absolute genius who has created a terrifying fictional scenario that sets a new standard in young adult novels. He's a master of taking what is seemingly a simple storyline, incorporating stunning metaphors and lovable characters that readers can relate to. He's simply brilliant. He could quite possibly be the author of the young adult generation. There are no words to describe how immaculate this series is. I demand you read it. The Infinite Wave will leave readers emotionally spent, myself included. I need a hug. I was looking at this novel just yesterday! Sadly, I wasn't one of the people who loved The 5th Wave. I love Sci Fi but I found it too slow paced for my liking but I understand why people loved it so much. I'm glad The Infinite Sea is good but I'm not sure whether I'll continue. Great review! Oh no, you didn't like it? I was actually completely obsessed with it. The Infinite Sea has a completely different feeling though, it's more about character development and it's more suspense based. I think you'll enjoy this one more, and it feels warmer and more engaging. I'm completely in love with this series. It's phenomenal! You need these in your life Eugenia. Go. Go now. Don't wait. *hugs for you* Fantabulous review, Kelly! I truly am looking forward to reading this one myself. Although I've heard a few "meh" things about it, so I'm not as excited as I originally was...however, seeing how much you loved it, makes me think I will too. Thanks Ebony. It has a completely different feel than book one, it's much more poetic and offers more perspective on the dying world, different character points of view and we finally see back stories on a few of the characters we loved from the original. It's suspenseful too. I really hope you fall in love with this one as much as I did. Glad you enjoyed it! I was so impressed with The 5th Wave. The writing and the thought put into the story was phenomenal. I'm super psyched for this one, and I'm glad it's so emotional. I thought The 5th Wave was almost a cold read at times. Thanks for the review! It was wasn't it. I think The 5th Wave mirrored the toughness that survivors faced just to make it through each day. But this one had a completely different feel, it tells character back stories, various points of view and doesn't focus on romance either, allowing for further character development. You'll love the new characters and epic ending. Book three is going to blow our socks clean off. Can't wait to see what you think of this one. Please tell me there's no Evan in this though. Because he annoys me endlessly and I NEED BEN AND CASSIE. Oh no, my lips are sealed. I deliberately left out any mention of him in my review, and can neither confirm or deny whether he's still alive. But you'll be happy to know that The Infinite Sea doesn't focus on romance Allie, I think you'll really enjoy this one. I know what you mean Kara, I think we tend to expect middle book syndrome with most sequels, but I'm so thankful this wasn't the case. It was different from The 5th Wave, more character development and had a more personal feel. It has been a while since I had read book one as well, but there are enough reminders during the first few chapters to jog your memory. I've been wanting to read The Fifth Wave for quite some time (especially with the movie being made) and I'm so glad to hear that the sequel is just as good. Very excited! I really hope you can pick it up soon, it's incredible! Looking forward to reading your thoughts. Incredibly intense! It was suspenseful and verging on poetic. The metaphors used to describe the new world were brilliant. I hope you enjoy this as much as I did Renee. Thanks Zoe. It's one of the best sequels I've read. I think fans of The 5th Wave will like the character development and suspense. Can't wait to see what you think of it. Joy, my thoughts exactly. I was still reading until 4:00am, I couldn't put it down. I was zombiefied the next day, but sooo worth it. Imagine how incredible book three is going to be. How the hell are we going to keep it together until then?